‘Wine Connection’ is a well know brand for quality western food and wines at affordable prices. Don’t miss one of the trendiest restaurants in town, the best place for you to hang out with friends and family in a ‘hip’ but cozy atmosphere. With a Deli & Bistro concept under one roof, Wine Connection provides the full bistro menu including; Australian Sirloin, Lamb Shanks, Burgers and Pizza. You can also enjoy the imported cheese & cold cuts and handmade pastry & bakery, both to dine-in or take home. 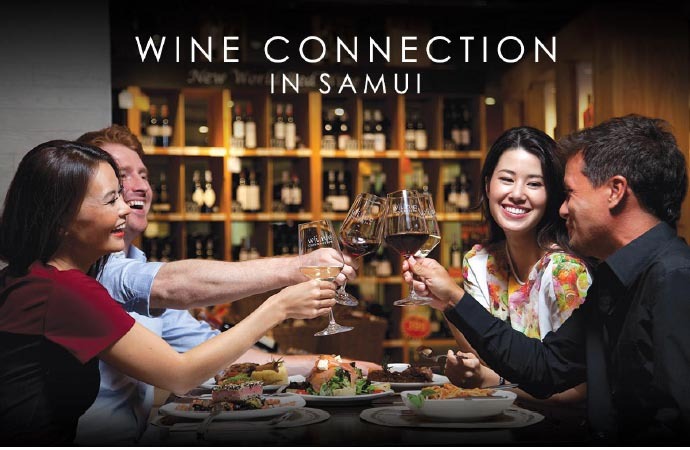 As the leading wine chain in South East Asia, we have a wide range of wines from around the world, as well as imported German & Belgian draft beers for everyday enjoyment. New and available in Samui, only at 349 Baht, “Jump Yards” our new, great value, Australian red and white wine, exclusive to Wine Connection and is suited to both new wine drinkers and party lovers. Location: Central Festival Samui, The Port Zone, Level 1. Opening hours: 11.00 am – 01.00 am. Reasonable to fine diners for taking too much food at a buffet or not?